The Ozone Enduro V2 is finally here! Our best selling kite just got even better! The absolute best in freestyle, freeride and wave riding there is! Finally the highly anticipated Ozone Enduro V2 is here! After the Enduro V1's unmistakable success as being one of the most diverse kites available on the market today, the V2 is now offers even better performance and stability in the big three kitesurfing disciplines; freeride, freestyle and wave riding. This years kite see's a new and improved strut construction and enhanced canopy support offering better stability during gusty conditions and while the leading edge is at a lower angle of attack. A more progressive power delivery and newly added tapered tips reducing any tip bounce, the Enduro V2 is now a perfected super smooth ride for any style of riding. For all you freeriders out there the smooth and predictable nature and characteristics of the Ozone Enduro V2 will offer you plenty of response and play while enjoying your ride. With the Enduro's quick turning speed and unmatching bar to kite feel you can boost to the sky or cruise until your hearts content. Utilising this open C-shape design this kite excels in freestyle kiteboarding from your first unhooked moves all the way up to advanced and more technical tricks that even a true pro could appreciate the level of control, stability and response. With these features on demand, the Enduro V2 is the perfect companion for a rider really looking to push the boundaries of modern day freestyle kiteboarding. The third setting is the wave setting to which lightens sheeting pressure and increases steering reactivity making the kite less powered when pivoting allowing you to focus more on the wave that you are tearing up. This setting also allows the kite to 'drift' backwards when the lines become slack without dropping out the sky. Quick turning, drift and power on demand are three main requirements of a performance level wave kite. With an outstanding wind range the Enduro works brilliantly in lighter conditions as a fast kite you can work and mid aspect kite as well as an absolutely insane boosting kite for the higher end conditions when things start to get crazy. For anyone who cant quite make their mind up as to which style of kite they are looking for, why settle for just one? Why not all three and give yourself that diversity to choose from on the day? The Ozone Enduro V2 offers the ability to progress across the three main disciplines in the sport with a performance and reputation like no other. So what sizes do I want in a quiver of Enduros? The most popular quiver sizes are a 9m and 12m with the added 7m for high wind use. For heavier riders an 8m/10m/12m quiver would also be good. We know the 10m is super sweet, so for lighter riders this will be a killer all round one kite with a bigger kite for light wind. 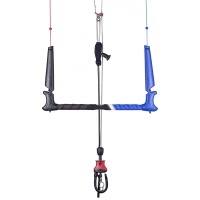 The 8m up to the 12m all run on the 50cm bar which instantly gives you a cheaper quiver, being able to purchase multiple kites but just one bar. Why not make it a complete kite and bar? 2018 delivers early with the all new Ozone Water Contact Bar now featuring at the bar steering line adjustments/ trim, larger floats and a lightly sanded, wrapped feel bar grip. The Ozone Contact Bar has been one of our favourite bars in our range for its clean and simple functionality.